Willian has assured Chelsea fans he will be staying at Stamford bridge amid Manchester United link. 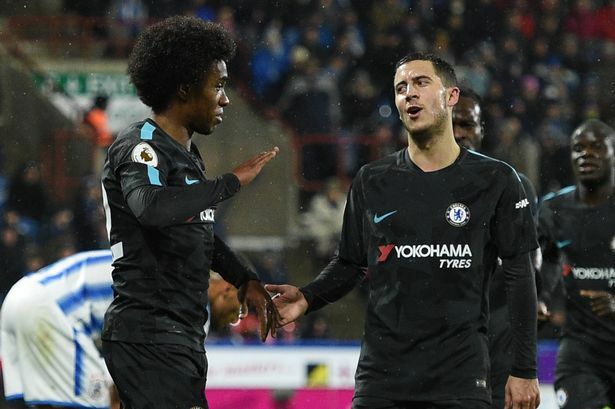 Willian has not been regular starter this season for Chelsea but he was the hero yesterday when he got a goal and two assist against Huddersfield in the 3-1 win. "I'm happy here and the fans can be calm,"Willian said after Chelsea had turned in a much improved display at Huddersfield. The 29-year-old has been linked with a move to Manchester United after growing frustration over his lack of game time under Antonio Conte. The highly rated winger has started only 12 games this season, but responded to his recall by heading home the second and laying on both Chelsea's other goals for Tiemoue Bakayoko and Pedro. "Of course I'm very happy,"he said. "When I play, I always try to do my best to help the team to score goals to make assists and I did that with my team-mates." Do you think Willian should remain at Stamford Bridge?